Royal Caribbean revealed many of the features today that will debut aboard Quantum of the Seas in late 2014. This first video will give you an overview of the ship's main features. We discuss them in more detail in the Cruise News Daily article appearing in our April 16, 2013, edition. Quantum will have an array of stateroom types, and this video is an overview of them. 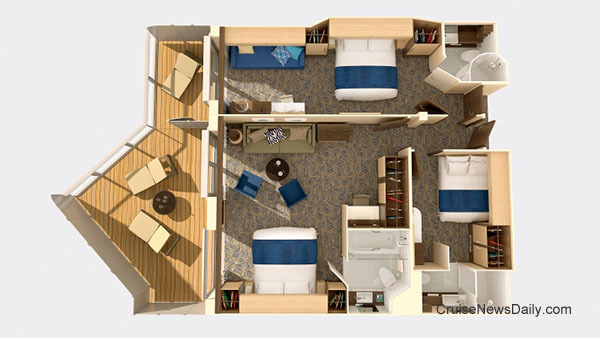 The Family-Connected staterooms combine three stateroom types. This floor plan should clarify how they will all fit together. 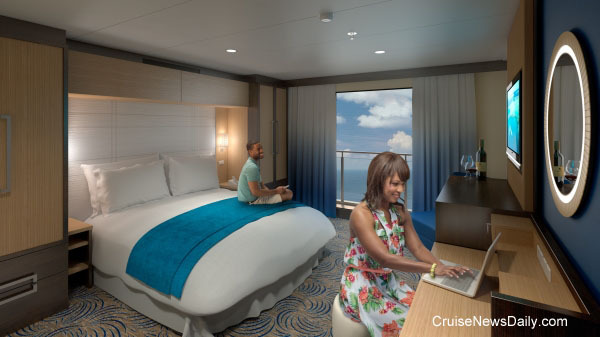 One of the innovations is going to be adding a "virtual balcony" to inside staterooms. A new aft lounge and entertainment area is called Two70. This video helps clarify the possibilities in this unique space. The final video details some more of what will become the signature features of Quantum of the Seas. The complete story and analysis appeared in the April 16, 2013, edition of Cruise News Daily.